Chanteuse Country US née Stephanie Kay Bentley, le 29 Avril 1963 à Thomasville (Georgie). 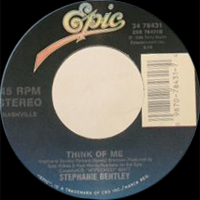 Georgia-born singer Stephanie Bentley earned her first taste of musical success at the age of nine, when she, her sister Camille, and a friend took top honors in a local talent contest. The young Vocals trio's success won Bentley a slot in a music and drama troupe, where she remained for a number of years, singing everything from show tunes to modern dance-pop and even performing at the White House for then-President Jimmy Carter. In 1984, she formed her own band, Special Delivery, which specialized in Top 40 music and oldies. After a stint in Georgia singing demos and advertising jingles, Bentley reunited with sister Camille and, as the Bentley Sisters, signed a Nashville production deal which failed to pan out. Discouraged, she eventually relocated to Nashville on a permanent basis and returned to recording demos; one, for a song called "Shake the Sugar Tree," was later used as a backing Vocals when the tune was recut by Pam Tillis. Another developmental deal followed, but again proved fruitless. A third contract, however, resulted in a hit 1995 duo with Ty Herndon, "Heart Half Empty." Bentley's solo debut, Hopechest, followed in 1996.